New York, NY: Clarkson Potter, 1993. BRAND NEW & COLLECTIBLE. First Edition, First Printing. Illustrated boards/Fine. DJ/None as Issued. 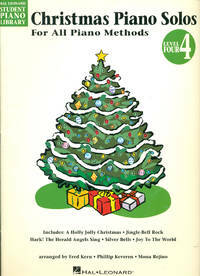 Anthology of 40 Christmas carols for the piano, with biological sketch of composers. 95 pgs w/color illustrations of which many are archival. . First Edition, First Printing. Hard Cover. NEW - COLLECTIBLE/None as Issued. Illus. by Isabelle Brent (Illustrator). First Edition, First Printing. Nashville, TN: The Upper Room , 1964. COLLECTIBLE. Trim, 1964, 33-page Vintage, SHEET MUSIC. Vocal & Piano. Text: BRAND NEW. White, stapled softcover/NF w/ trace soiling. COVER ART: Pine branch. Devotional guide of 31 Christmas carols assembled by The Upper Room. The carols are preceeded by "Christmas Stories from the Gospels.. First Edition, First Thus. Soft Cover/Sheet Music. NEAR FINE- COLLECTIBLE/None as Issued. Vintage/Christmas Songs. New York, NY: Mills Music, 1959. 4-page Vintage SHEET MUSIC. Vocal & Piano. SCORE: As New. Softcover/VG w/trace edge wear and light surface rubs. Song is the forerunner of "The Litte Drummer Boy". Composed by Missouri-born Katherine Kennicott Davis (1892 - 1980) who was a teacher (Concord Academy, Concord, MA), classical music composer and pianist. This 1941 work, "Carol of the Drums", was re-arranged, retitled and recorded as "The Little Drummer Boy" in 1958, propelling it to instant fame.. Paperback/Sheet Music. Very Good/None as Issued. Vintage/X'mas Sheet Music. New York, NY: Clarkson Potter, 1994. BRAND NEW & COLLECTIBLE. First Edition, First Printing. Indigo blue linen boards w/gilt spine lettering. DJ cover photo of award-winning, Minnesota-born Finnish chef Beatrice Ojakangas, who has been seen on Julia Child and Martha Stewart TV shows, and inducted to the James Beard Award for Cookbook Hall of Fame, 2005. This comprehensive volume offers some 250 recipes of breads, cookies, cakes, pastries and other festive specialties, celebrating 21 annual holidays from spring to winter. 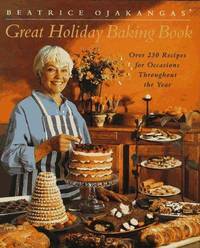 Also ideas for a "cookie-swap party" as well as pointers on baking with children.. First Edition, First Printing. Hard Cover. NEW - COLLECTIBLE/New. First Edition, First Printing. Studio City, CA: Flea Market Music, Inc., 1998. BRAND NEW COPY. 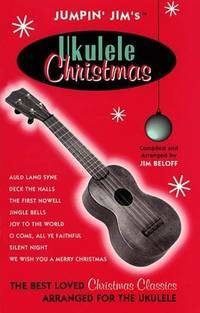 Anthology or 30 beloved Christmas carols arranged for the ukulele. Ukulele cord charts precede songs. 56 pgs. 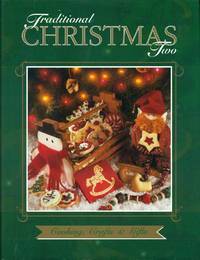 Collection includes: Auld Lang Syne; Deck the Halls; The First Nowell; Jingle Bells; Joy to the World; O Come, All ye Faithful; Silent Night; and, We Wish You a Merry Christmas.. First Edition, 4th Printing. Soft Cover/Sheet Music. NEW/None as Issued. San Juan, Puerto Rico: Ediciones Alba, 1986. BRAND NEW COPY. 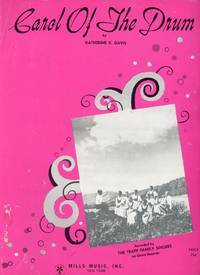 A portait, in prose and photographs, of the Coamo region in Puerto Rico. Towns celebrate the festivities in honor of the patron saints where religious processions still preserve traditions of the Catholic Church when first introduced, along with elements from Africa, and local color born from mixing of immigrants, such as modern day marathons. 96 pgs. 8 chapters: I, Trasfondo Historicos; II, La Medida de San Blas; III, Otros RecursosTerapeuticoas; IV, Ofrendas Votivas; V, Medidas Preventivas; VI, Las Imagenes de San Blas; VII, San Blas y la Candelaria; and VII, Las Fiestas Patronales de Coamo. . First Edition, First Thus. Paperback. NEW/None as Issued. Illus. by Pablo Delano (Fotografias). Text/Spanish. New York, NY: McCall Pattern Company, 1998. SEWING PATTERN. NEW. McCall's pattern #9444. McCALL'S CRAFTS series. Christmas holidays' crafts. Centerpiece is a 12 inch snowman with a knitted hat, plaid scarf, appliqued mittens, and, a cheerful smile. Also patterns for smaller snowmen and garland.. Sewing Pattern #9444. Sewing Pattern/Envelope. NEW/None as Issued. Vintage/Sewing Pattern. New York, NY: McCall Pattern Company, 2000. SEWING PATTERN. NEW. McCall's pattern #2814. McCALL'S COSTUMES series. Size Z: Lrg-Xlg, for misses', men and teen boys. Bellydancer costume with halter top, overskirt and kerchief. Jester costume includes tunic with wide sleeves worn with belt over pants, and hat with velcro closure.. Sewing Pattern #2814. Sewing Pattern/Envelope. NEW/None as Issued. Vintage/Sewing Pattern. New York, NY: McCall Pattern Company, 2002. SEWING PATTERN. NEW w/store stamps to front of envelope. McCall's pattern #8307. McCALL'S COSTUMES series. Size: 3, 4. Glamourus gowns for very, young ladies. Versatile designs for creative embellishments. Cover art shows full length gowns (ruffle, full, waisted and loose) for bride, fairy princess, femme fatale, and popular songstress. . Sewing Pattern #8307. Sewing Pattern/Envelope. NEW/None as Issued. Vintage/Sewing Pattern. New York, NY: McCall Pattern Company, 1997. SEWING PATTERN. NEW. McCall's pattern #8827. McCALL'S COSTUMES series. Size: Men's Medium: 38, 40, and leggings in stretch fabrics only. 16 patterns pieces. Patterns for tunics in two length, leggings, a beret and a pouch.. Sewing Pattern #8827. Sewing Pattern/Envelope. NEW/None as Issued. Vintage/Sewing Pattern. New York, NY: McCall Pattern Company, 2000. SEWING PATTERN. NEW. McCall's pattern #2802. McCALL'S COSTUMES series. Size Y: Sml-Med. Historical Renaissance costumes for men. Patterns include, surcoat, front laced tunic w/o sleeves, shirt w/gathered sleeves, leggings, and hats.. Sewing Pattern #2802. Sewing Pattern/Envelope. NEW/None as Issued. Vintage/Sewing Pattern. New York, NY: Cartwheel Books/Scholastic, 2003. BRAND NEW & COLLECTIBLE w/trace wear to corner tips of softcover. First Edition, First Printing. Celebrating of Hanukkah --- the happy Festival of Lights. Outstanding instance in visual arts presentation characterized by ingenious usage of color, graphics, and candle-shaped die cuts; a joy for young and old. 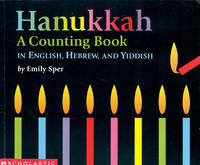 Emily Sper interdisperses historical backgrounds and symbolic meanings of traditional rituals while teaching the young to count to eight in English, Hebrew and Yiddish. A wealth of information that the young will absorb unknowingly. Graphic, vibrant artwork and die-cuts in the shape of candles combine to create this informative and elegant book about one of the most joyous Jewish holidays. The symbols of Hanukkah, the Festival of Lights, are visually presented to stunning effect as young children learn to count in three different languages from one to eight. Die-cuts of colorful candles--one for each night of Hanukkah--against rich black backgrounds add up one by one with each turn of the page. The importance of the menorah, shamash candle, dreidels, and more are explained in this simple retelling of the story of Hanukkah. First Edition, First Printing. Paperback. NEW/None as Issued. First Edition, First Printing. New York, NY: Smithmark Pub, 1995. BRAND NEW COPY w/trace edge wear & small indent to upper left of dust jacket. 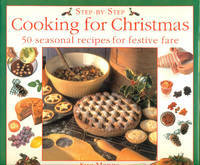 A collection of 50 Christmas recipes from Sue Maggs, who both trained and taught at the Cordon Bleu Cooking School. Augmented by som 300 color photos, this rich collection of seasonal Christmas fare are infinitely suitable for happy ocassions year-round.occasions --- for instance, spiced roasted nuts, cheese & pesto pastries, tenderloin of pork wrapped in bacon w/onion & prune gravy, vegetarian torte...... Hard Cover. NEW/Near Fine. Illus. by Karl Adamson (Photographer). New York, NY: Martha Stewart Living, 2000. BRAND NEW COPY w/a whisper of surface to magazine's softcover. 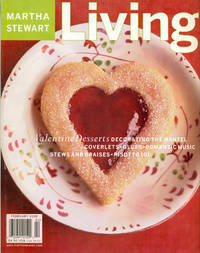 COVER ART: Jam filled heart-shaped sugar cookie. Cookery and arts & crafts. Issue also explores slow-cooked meats, coverlets putting old handerchiefs, tablecloths and blankets to creative use.. February 2000. Soft Cover/Magazine. NEW/None as Issued. Milwaukee, WI: Hal Leonard Corp, 1997. BRAND NEW COPY w/a whisper of wear to corner tips of softcover. 31 pgs. 13 traditional Christmas songs arranged for Level 4 pianists. Selections include: A Holly Jolly Christmas; Jingle-Bell Rock; Hark! The Herald Angels Sing; Silver Bells; and Joy to the World.. Soft Cover/Music. NEW/None as Issued. New York, NY: Doubleday, 1996. BRAND NEW & COLLECTIBLE. First Edition, First Printing. Cookery. 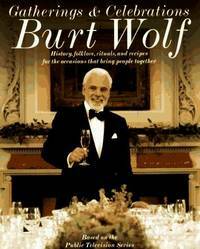 Recipes celebrating major international holidays cookery wothy of reproducing assembled by journalist, writer and TV producer Burt Wolf (1938 -). Historical regional cultural backgrounds eludicate selections. 353 pgs, 21 chapters with color photos.. First Edition, First Printing. Hard Cover. NEW - COLLECTIBLE/New. First Edition, First Printing. Garden City, NY: Doubleday & Co, 1982. Text/BRAND NEW w/faint, inexplicable discoloration (publisher's flaw) to upper margin of page 25. Softcover/NF w/light edge & surface wear. 64 pages. 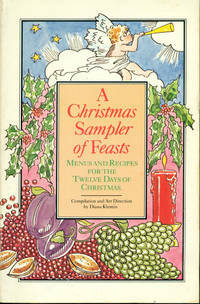 Compilation of Christmas, and New Year, delights selected from the many cookbooks Doubleday has published.. First Edition, First Thus. Soft Cover. NEAR FINE/None as Issued. Illus. by Mona Mark (Illustrator). Minnetonka, MN: Cowles Creative Publishing, 1997. BRAND NEW COPY w/trace wear to dustjacket. First Edition, First Printing. 318 pages. Handcrafted treasures and home-cooked treats for the traditional Christmas. Contents, illustrated w/color photos, in 8 sections: 1, Decorating the Tree; 2, The Holiday Table; 3, Around the House; 4, Appetizers, Snacks & Beverages; 5, Christmas Cookies; 6, Desserts & Sweets; 7, Gifts frpm the Kitchen; and 8, Patterns.. First Edition, First Printing. Hard Cover. NEW - COLLECTIBLE/Near Fine. New York, NY: Hatherleigh Press, 2007. BRAND NEW COPY w/trace wear to corner tips of softcover. A dialogue, a handbook for planning a stylish, joyful wedding that is also environmentally friendly, socially responsible, and affordable. Simple reminders include use of in-season flowers, eliminate "save-the-date" cards and save some trees, and avoid purchase of items just for the wedding day and consider dresses, shoes, glassware, etc for later use. From the location to the dress to the menu, there are dozens of easy ways to make your wedding beautiful and still reflect your personal beliefs in sustainable living. 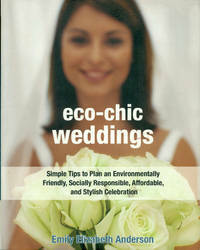 Eco-Chic Weddings will show you how to craft your perfect day.. First Edition. 3rd Printing. Soft Cover. NEW/None as Issued. Window Rock, AZ: Maazo Publishing, 1985. BRAND NEW COPY w/trace edge wear to softcover. 1965 Offical Souvenir Program and Information Handbook. Frontispiece: Photo portrait of Chairman Raymond Nakai of the Navajo Tribal Council. Record of events covering September 9th through 12th, 1965 --- an annual celebration dating to 1952. 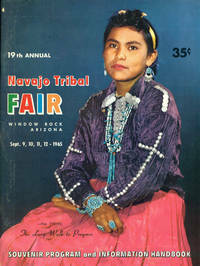 Welcoming statement, "Come to the Navajo Fair" by Evelyn Brock Measeles, repint of article first published in the Arizona Highways magazine of August, 1962, gives a historical perspective of the Fair's evolution.. Soft Cover. NEW/None as Issued. 1985 Souvenir Edition.